I'm Disney, from Ruffles and Stuff! Thank you so much for welcoming me here today! 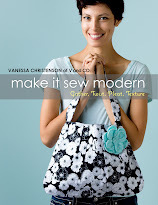 I have to admit that I feel incredibly honored to be guest posting for Vanessa. I don't have to tell you how completely and intimidatingly amazing she is. I put her on such a crafty pedestal! I'm so excited to share a little bit of my creative world with you today! This project is a little something I stole from our dear friends over at Potter Barn. 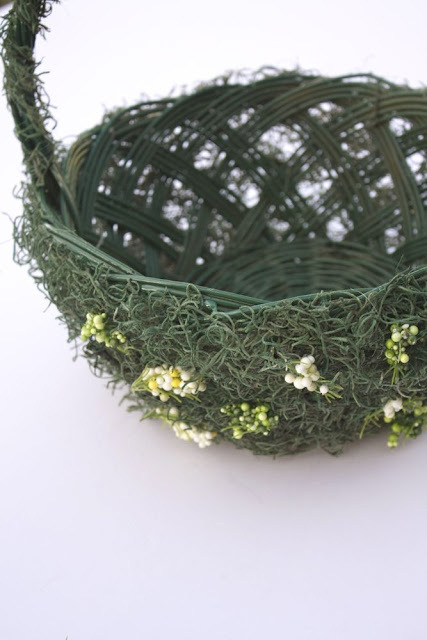 I love their "Natural Easter Basket", but even if I could afford it, it's no longer available! So, I made my own for about $4! 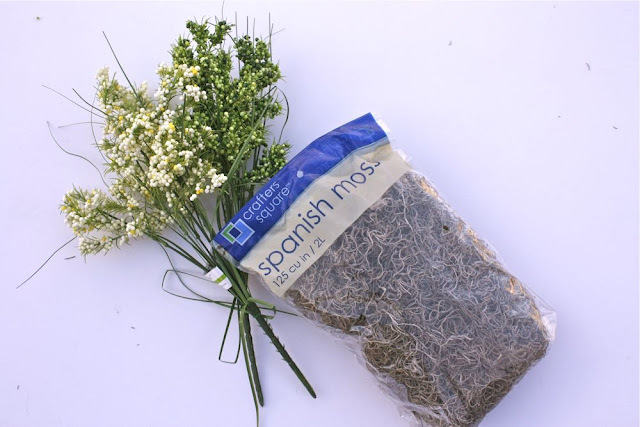 Then you'll need spanish moss, and some "berry bushes". I got both at the Dollar Tree! 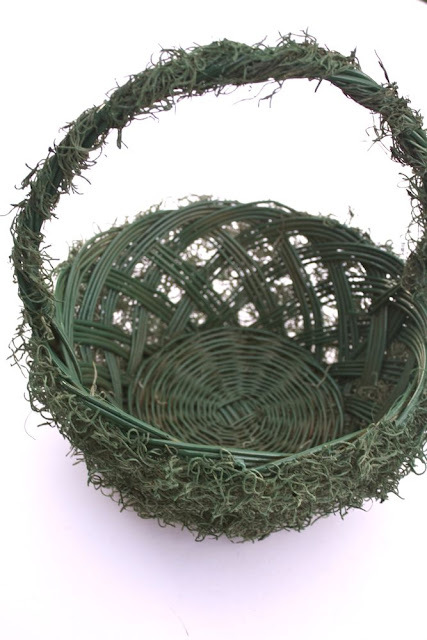 Once your basket is covered, spray a light coat of the same green paint over all the moss. I love it if a little of the natural moss color shows here and there, it's so natural looking! Take your berry bushes (I used 1 green bush, and 1 white), and cut them into small sections with craft scissors. 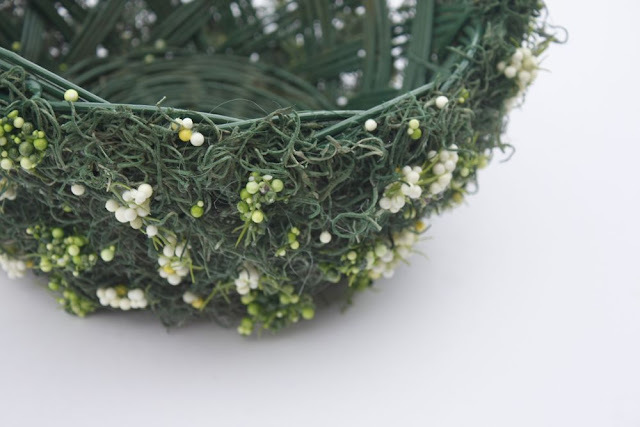 Then glue them to your basket with your glue gun, about 1.5-2 inches apart, alternating the green and white. Don't forget the handle! And still cute enough for the little ones! Thanks so much for having me Vanessa! And thank you all for hanging out with me today! HA! you all know how i feel about pottery barn! so this project was perfect! thank you so much disney for taking the time and talent and bringing it over here for the day! make sure to go check out disney and all her fabulous ideas! 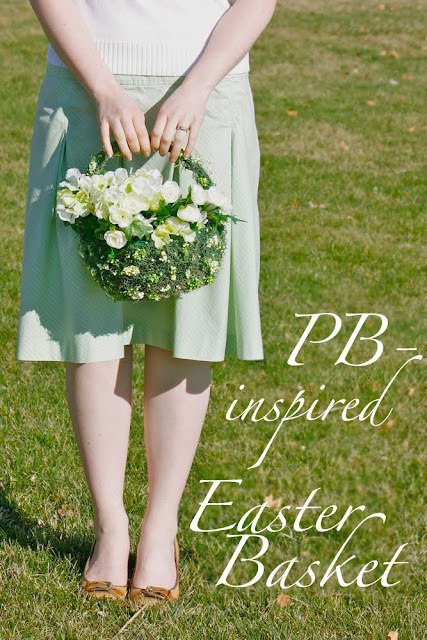 i'll see you monday with an easter inspired tutorial as well! v and co loves her sponsors! currently i'm swooning over this line over at the fat quarter shop! Disney, where does your creativity end? It doesn't!!! Awesomely cute! two of my favorite bloggers...on one page! yay! That is the prettiest Easter basket I have every seen. Love, love, love this! I like things that inspire everyone to craft...not intimidate. This is beautiful. i think this would make a beautiful centerpiece for my back porch table setting at Easter brunch! I saw these in the catalog and loved them. Now,it I only had time to make one. 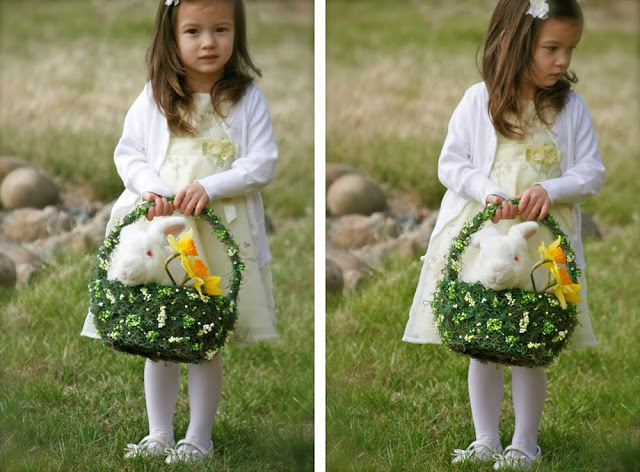 Then I'd have to stage the photo, and buy ANOTHER bunny, and well, I give up. Maybe next year! Love your blog! Oh, that's genius and easy and beautiful. You can't get much better than that. Thanks for sharing and giving me a new blog to add to my bloglist! 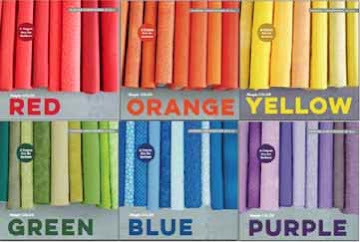 I'm featuring this at somedaycrafts.blogspot.com today! Holy dang V, you sure did get a lot of comments! I comment right in the 1200 range and was amazed. Then to see that you still got over 100 more...super FANtabulous! Way to go girl!!! 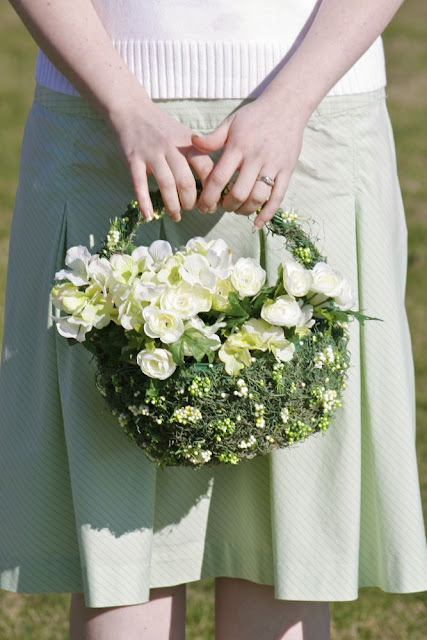 my daughter is getting married this summer, what a cute flower girl basket, Thank you!! Oh, this is awesome! PB who? Great job, and pictures too! Disney already knows I am obsessed with everything she does so imagine my excitment to find her here woot woot. Super cute! Thanks for sharing. I was gonna ask how you got that bunny to sit so still.........then, I looked again. doh! Cool and easy! Love it! Since my little ones are pretty big ones, now, this is perfect! 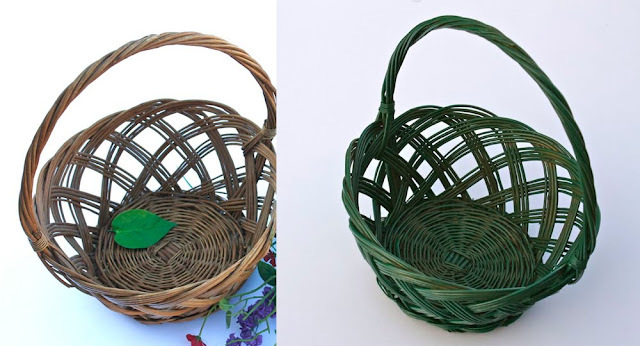 I do have plenty of baskets to transform-I, too, have a basket problem! Ah, that is so cute and so easy to do. Thanks for the wonderful turtorial. I'm going over to visit her blog right now. so cool. and yes, way better than the pottery barn one. I know I've said a thousand times....but I will never get sick of seeing pictures of your ADORABLE daughter. I want to give her a little squeeze! 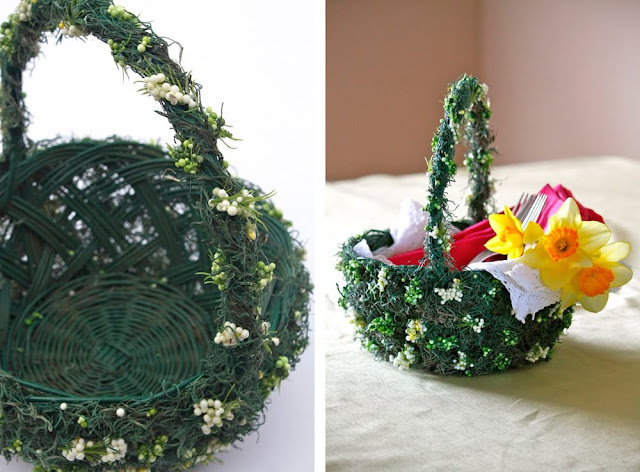 What an absolutely precious decorated basket. Thanks to your guest for the wonderful tutorial. Cute little model in the photos. great ideas, great work and great photos as ALWAYS. You inspire...me!!!! Aww, that is super cute! Thanks so much to both of you, I'll be linking. 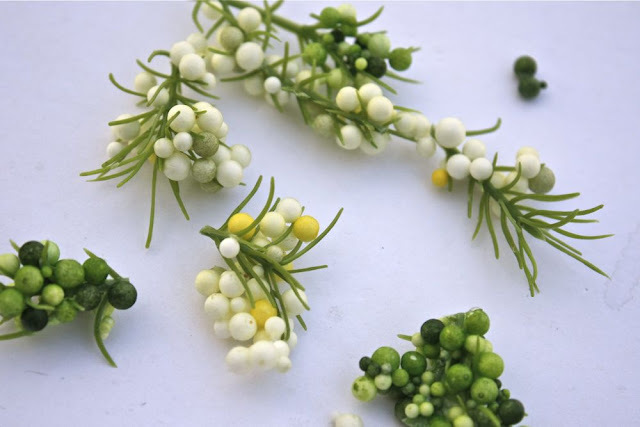 I am making a grapevine wreath for my front door using that same technique. The paint is drying as I type. Thank goodness for dollar tree- love that store. This basket is beautiful... I want to make one for my little girlies. BTW...your little one is absolutely adorable. Love the simple feeling of it!